Is there any more iconic way to explore California than to travel by car along the coastline, taking in views of the Pacific as you cruise at your leisure, stopping where you want and exploring all that the state has to offer? This was our goal when we set off on the Highway 1 Discovery Route heading north in search of what makes this region so unique. Our aim was to hop on Highway 1 after a short stay in Morro Bay and head as far north as we had time for, before circling back to go home. This stunning stretch of the highway hugs the coastline, winding its way along rocky outcrops and long stretches of unoccupied beaches. Oh to have had a surfboard with me, and more importantly, knew how to surf properly, I’m not sure we would have made it much farther. The first town we visited was Cayucos. With its low-key vibe, small bungalows looking out over the beach and main street populated by mom-and-pop shops, the town hints at what many of these communities along the California coast looked like long before development. 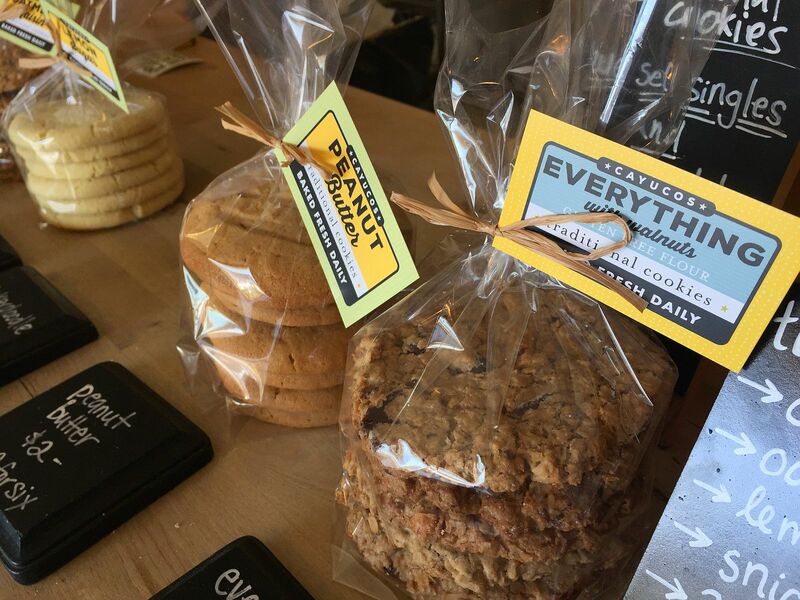 Our goal for the short stop was the famous Brown Butter Cookie Company. Known all over the region (and the country), this sister-owned cookie company is a working factory with its cookie makers busy assembling the confections in the middle of the shop for all to watch who wander in. We picked up a multi-pack sampler that included bourbon, sea salt and cinnamon flavors, and jumped back in the car. An hour later we pulled into the town of Cambria, the popular seaside village known for its great ocean views, as well as its close proximity to the area’s most famous attraction, Hearst Castle. 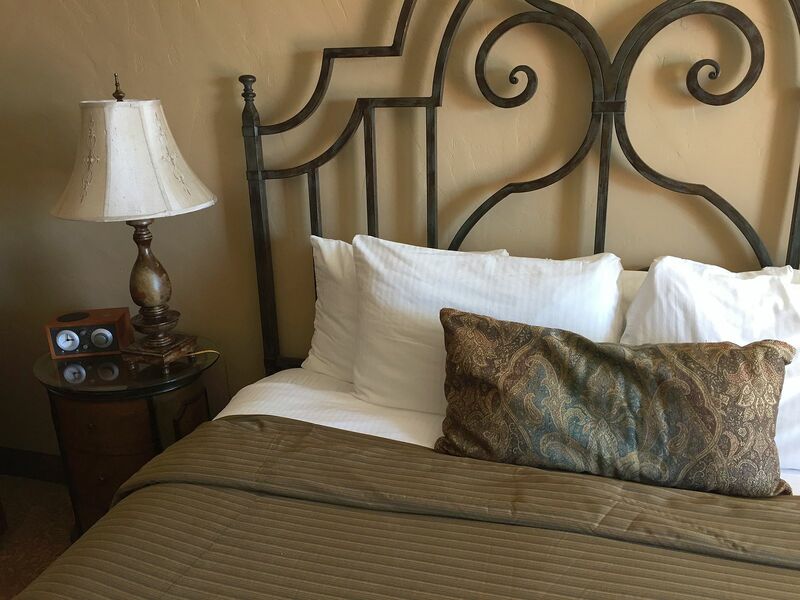 We checked in at Blue Dolphin Inn, a newly renovated motel now made into a fashionable inn, complete with six specialty themed suites based upon locations in the world where dolphins are found. The expansive Moonstone Beach and the town’s boardwalk sit directly across the street, and if you’re okay with leaving the windows open, you can enjoy the sound of the ocean as you sleep (mixed in with the sound of occasional passing traffic). The main part of town is found inland away from the coast, home to a number of restaurants and shops for visitors. We decided on Robin’s Restaurant, a well-known eatery that’s held court for over a quarter of a century. Starting off in a health food store, Robin’s grew in popularity and owners Robin Covey and Shanny Covey soon moved into an adobe house where the restaurant is today. 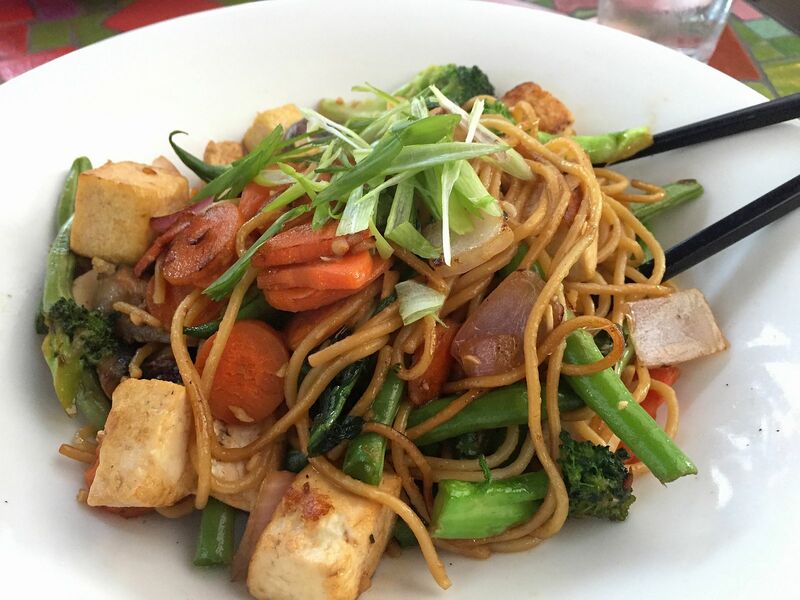 Sitting outside on their canopied back deck, we ordered the Vietnamese spring rolls, followed by the prawn enchiladas and one of their signature curry dishes, Robin’s Chow, a stir fry featuring fresh vegetables. Following a tip given by Mandy, our kayak guide from the day before, we finished the night with drinks at Centrally Grown, a bar and grill that offers sweeping views of the ocean from its hilltop perch, as well as weekly live music outside. 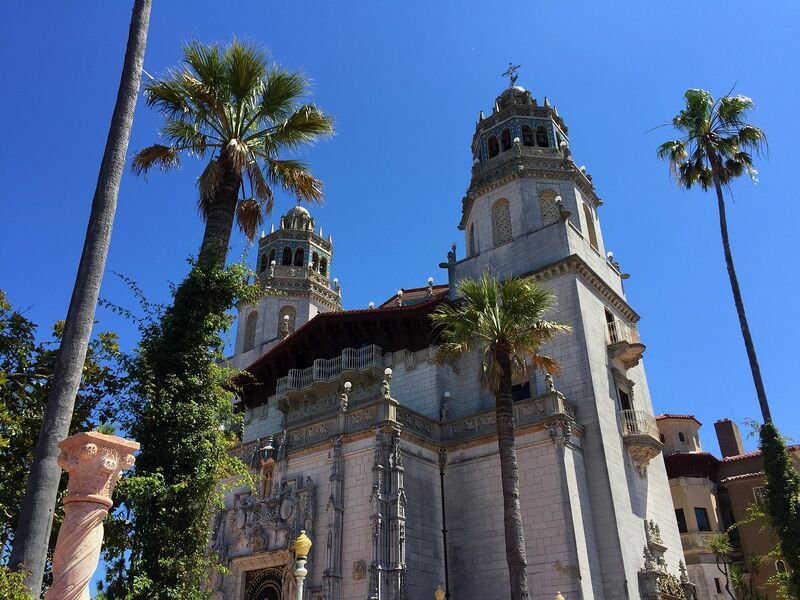 For most people, the culmination of Highway 1 lies far up on a hillside above the highway, out of sight but certainly not out of mind for anyone in the area: Hearst Castle. Located a short drive north in Sam Simeon, we found ourselves the next morning on a tour bus chugging along a windy road up a barren hill, the voice of Alex Trebek narrating the history of the late media baron’s “summer home.” Built on a 40,000-acre estate bought by William Randolph Hearst’s father in 1865 (later expanded to over 265,000 acres), the complex is comprised of the main building (Casa Grande — modeled after the church Santa María la Mayor, in Ronda, Spain) as well as three guest houses, the famous Neptune Pool and accompanying indoor Roman Pool, as well as a nearby zoo that was once home to hundreds of animals, many of which were free to roam the land. In all, Hearst Castle is made up of 58 rooms, 41 fireplaces, and requires half a million gallons of water to fill both pools. With the sun beating down on us, the temperature inched up to over 100 degrees as we reached the top. The castle, now officially a California Historic Landmark (with private access for Hearst’s heirs), offers several tours. We opted for the La Casa Grande Rooms Tour, the guided tour of the main living room (complete with a hanging wood ceiling and Renaissance-era tapestries covering the expansive walls), as well as the Medieval-style dining room, billiard room and classic movie theater where the likes of Charlie Chaplin, Cary Grant and Joan Crawford once were entertained. After the tour, visitors are free to roam the grounds for as long as they want. We took our time exploring the nooks and crannies around the several guest houses, as well hiding from the sun inside the lavish Roman Pool. Had the late morning’s heat not started to finally wear us down, we could have spent at least another hour exploring the meticulously maintained grounds and surrounding gardens. Back down the hill and across the highway, we stopped in town at Sebastien’s General Store, a former general store and still home to a small post office that can date its history back to 1867. 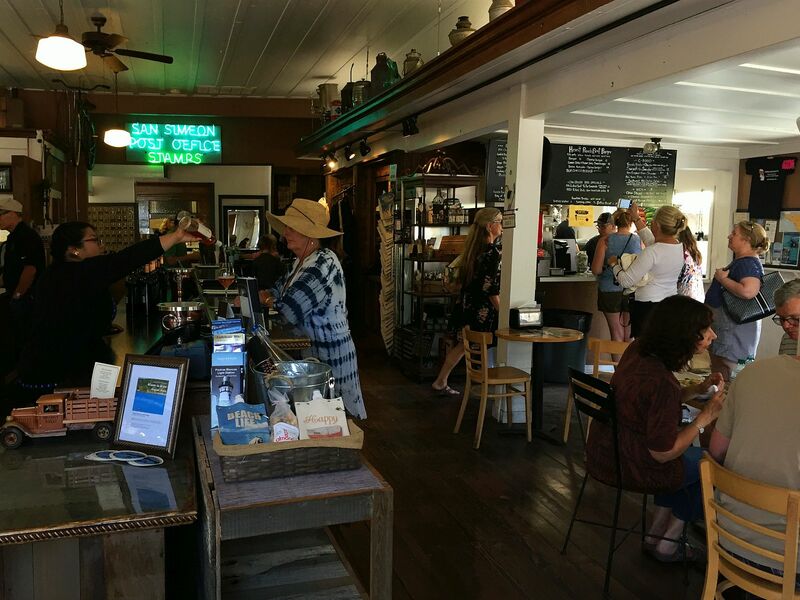 The store is now home to the Hearst Ranch Winery tasting room and a small cafe specializing in burgers made from cattle from the Hearst Ranch. My favorite from the tasting was the gold-medal Cabernet Sauvignon (look for the black cherry, lush blackberry, and roasted coffee bean flavors), but you’d be hard-pressed to find any you didn’t like, especially paired with a grilled cheeseburger. With the afternoon sun beating down on the coastline, it was a perfect time to check out the area’s most famous sunbathers: the northern elephant seal. 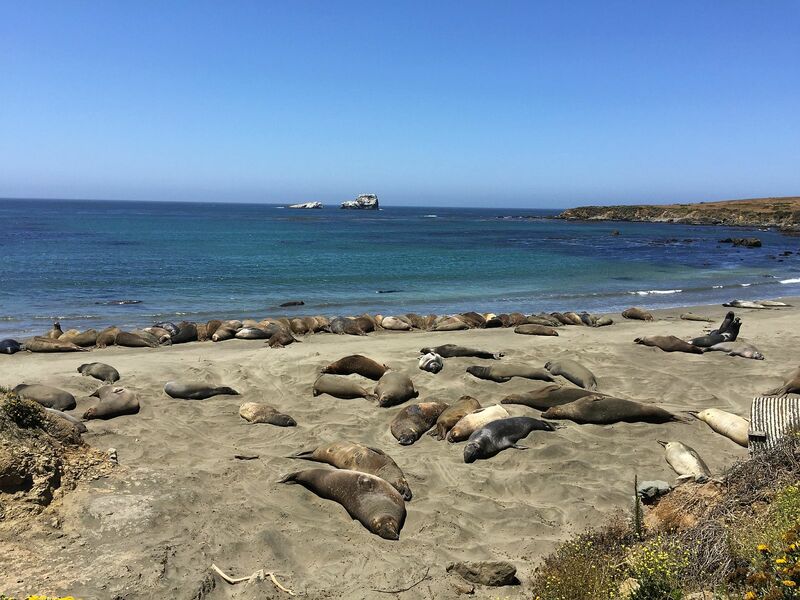 A short drive north along Highway 1 from San Simeon is the Elephant Seal Rookery, home to an ever-growing colony of elephant seals who come ashore for one-month intervals, twice a year: during the winter for mating season, and then in the summer to molt and grow new fur. Parking our car in the small lot next to the beach, we followed the elevated viewing platform until coming upon a small section of the beach were a rotating group of 50 to 75 elephant seals were lounging about on the water’s edge, their massive bodies piled upon each other, forming a heaving, massive blob of life. The elephant seal is the largest seal in the Northern Hemisphere and the second largest seal in the world — their lengths reaching up to 16 feet long and weighing upwards of 4,000 to 5,000 pounds. From above, we watched as the seals swam out of the water and pushed their way into the middle of already crowded groups for a spot to lounge, while others were content to slither their way further up the beach and flip cool sand onto their bodies with their short arms. Looking north, I could see Highway 1 snaking northward along a dry valley, eventually leading to Ragged Point, through Big Sur and on to Monterey and San Francisco. But this would be as far north as we would be traveling. Tomorrow it was back south for us. Luckily, I had saved room in my luggage to take home several bottles of wine collected along they way, reminders of the road trip for another day.